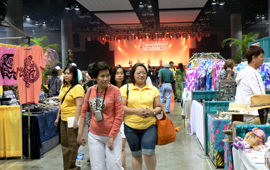 The Craft Fair was held for 2 days on Saturday, March 15 and Sunday, March 16 at the Hawaii Convention Center. There were lots of booths where you can experience hands-on activities and purchase crafts of various countries including Japan and Hawaii. About 2/3 of space were filled with booths inside the venue. There were more visitors during lunch time, which became too crowded to move around. Most popular were the locally made products such as handmade cookies, natural soaps, hula goods, bags and fashion accessories. There were shops from neighboring islands other than Oahu.Those products that are made in Hawaii were popular especially among the tourists for purchasing souvenirs. Also, there were vendors from the local’s favorite Aloha Stadium Swap Meet. In addition, Tangi Tully played his ukulele by the booth of Tangi Ukulele (ukulele brand in Oahu). He is a ukulele player that produced the Tangi Ukulele. The Beijing Tourism Development Committee promoted the 2008 Beijing Summer Olympics. Shabri of Hawaii offers handmade cookies from Ewa, Oahu. Coconut Jewelry offers fashion accessories that are made out of coconuts. Ahhhloha Bath Salts, Etc. offers natural bath salts and body soaps which are all made in Hawaii. Katy Johnson is a vendor from Hilo, Hawaii. She is offering bags and small accessories with Hawaiian design in a reasonable price. Da Bag Place offers pants and T-shirts which are neatly designed with patterns of old rice bag. They looked comfortable. Furthermore, there were booths where you can experience crafting and Japanese traditional arts such as temari (Japanese handball), origami (paper-folding), Japanese calligraphy, picture letter and ikebana (flower arrangement). Both adults and children forgot the time and enjoyed various activities. Some of the crafters from Japan weren’t fluent in English however, they were still able to communicate via simple English. The communication between the crafters and their guests went beyond the language barrier. After crafting, the guests looked very pleased with their finished product and the crafters looked very happy as they saw their guests cherishing it. We were delighted just by witnessing such scene. The Honolulu Festival’s Craft Fair is an annual cultural exchange event which introduces Japanese culture as roots of Japanese Hawaiians as well as one of the different cultures beyond the language barriers. Mr. Shiva traveled from Canada. He experienced fukiya (blowgun) n Hawaii. Eco cloth zouri can be created by using old T-shirts, which the guests seemed interested. The children challenged Japanese calligraphy by observing its example. The activities that use a brush such as Japanese calligraphy and art were popular. One of the important factors in creating the picture letter is to carefully observe the material that you have chosen to draw. She was able to draw such a nice picture with a brush! Temarai is made with a thread by matching its colors. There was along queue by the booth of ikebana. There were students from Kamehameha Schools Maui that won the Maui Mikoshi Design Contest. The demonstration of Japanese tea ceremony was held for 2 days on Saturday, March 15 and Sunday March 16 at the Hawaii Convention Center. The tatami mat was covered for the floor on the stage. Also, the stage was decorated with flowers and a hanging scroll, which created an authentic atmosphere. In addition, the demonstrators were wearing a kimono. At the same time, various performances were taking place at the Hawaii Convention Center. Despite of it, we could feel the slow time passing by as we were observing the preparation of tea demonstrated in the Japanese tea ceremony, which we felt a sense of tranquility as well. During preparation, snacks and tea were served to the audiences as well. The cookie was served as a snack which seemed to be unique for the Japanese tea ceremony but it became more favorable for the Westerners. Also, it seemed like the tea was rare for many people whom they were holding a bowl of tea on one hand as well as a camera on the other to take pictures. The audience carefully receives their little snacks. The audience looked nervous as she was handed a bowl.